The runways have spoken: old school hair accessories are back in a big way. The nostalgia in fashion is realer than ever this season. Early 2000s trends are back in full swing, '90s supermodels are gracing the runways once again and even Skechers are poised for a cool-girl comeback. So, it seems only logical that the hair accessories you rocked as a child are officially cool for grown-ups now. As per the Spring 2018 runway collections, take a moment to return to a simpler time. The first hair accessory runway revival came in the form of scrunchies at Mansur Gavriel. Ponytails were pulled in low and loose with fancy versions of the iconic '90s elastics — and everyone was shook. Surely it was a fashion fluke, right? Wrong. Then came the Versace show in Milan, where model after model was sent out donning the embellished barrettes of our youth before a -jaw-dropping finale that featured the original supes. 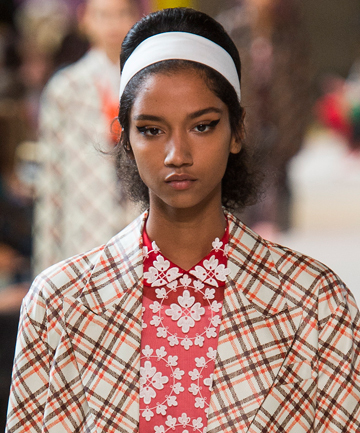 Miu Miu brought back the wide stretch headbands that dominated back in the late '90s/early aughts and we were somehow so ready for it. Rodarte, who made an early showing in Paris over the summer, took a stance on ribbons and bows for grown women — and it was a strong vote in favor of. The designers have spoken: Adorn your hair as in the days of yore. If you're ready to throw it back to a more innocent time, we've shopped the four hair accessories of your childhood that are ready to come back around.